Hi all. Back to the Tiamat hydra for the Chromatic Dragon restaurant. I’ve established the relative positions of all the heads. 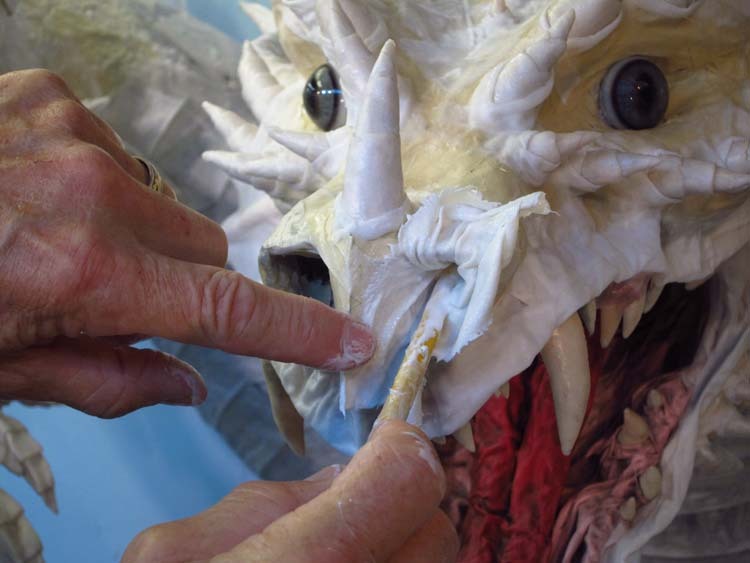 I know what I want as far as the look and attitude of each dragon head. So now it’s time to build each head. I left off on the last post with the beginning of the red dragon. I’d added the all important long horns. I’ll pick up from there. 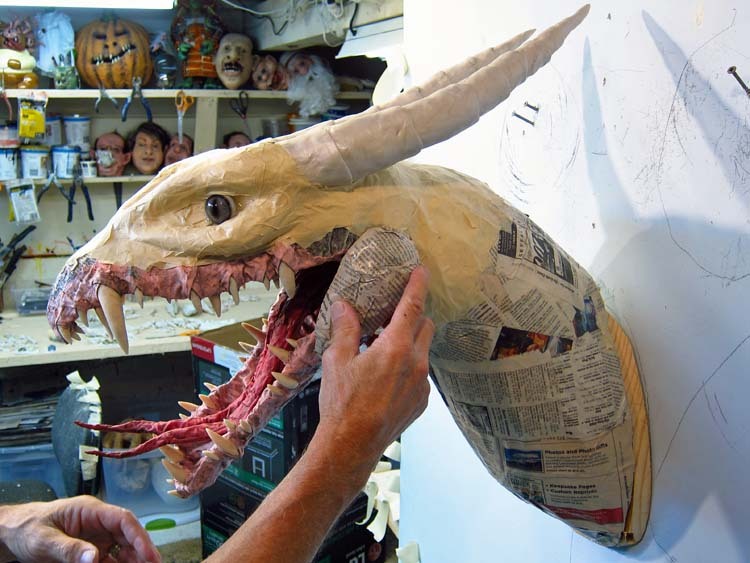 As you can see, I used paper mache shells to build up the face. Here I’m adding some jowls. I’ve already added some brows, a cheekbones, and put in the eyes. The red dragon is characterized as very aggressive. 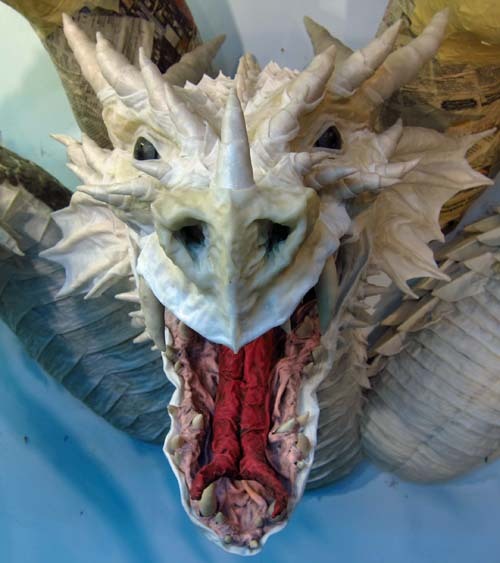 The Dungeons and Dragons literature describes, “Two of the frills on the sides of a red dragon’s head aid in its hearing ability.” It goes on the say that they are not actually ears. They just assist the inner ear of the dragon. Fair enough. I added the structure for these frills. I draped these with cloth. When dry I trimmed them them the way I wanted. 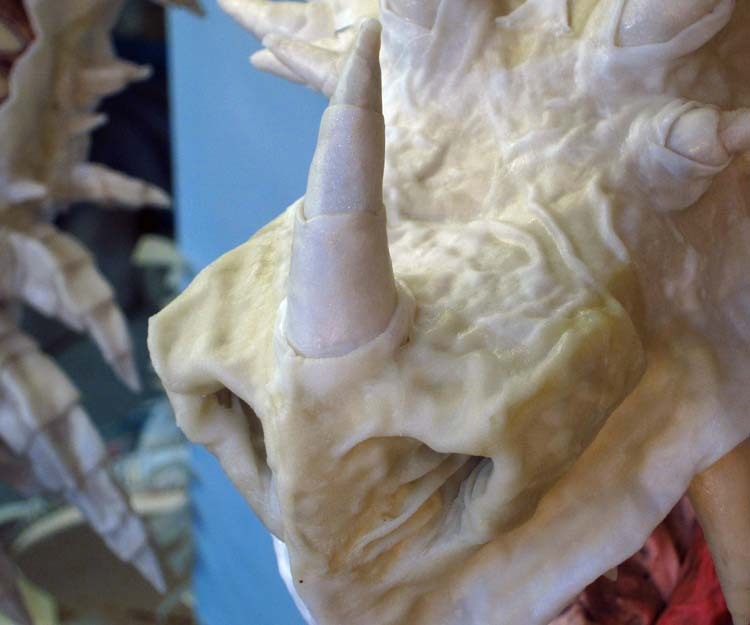 I built the nose using more paper mache shells. I added the cloth mache to this. Then I started adding horns. Lots of horns. All over the head horns. Horns for breakfast, lunch, and dinner. I added cloth mache around them. I also added lips and a few other details. I also added the breast plates using my cloth mache. 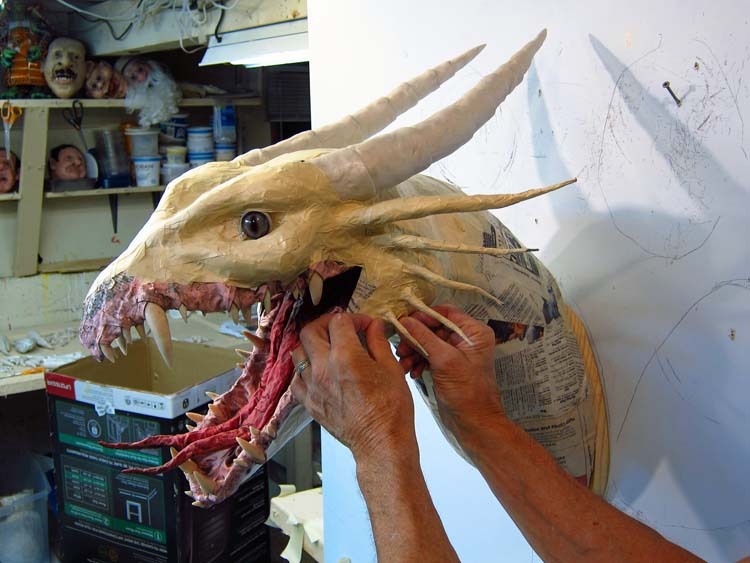 After that I added the scales, up the neck, and onto the top of the head and the nose. Here he is from the side, ready for paint. That will come after I build the other four heads. Here he is from the front. I’ll show you another head in the next post. Thanks for stopping by! 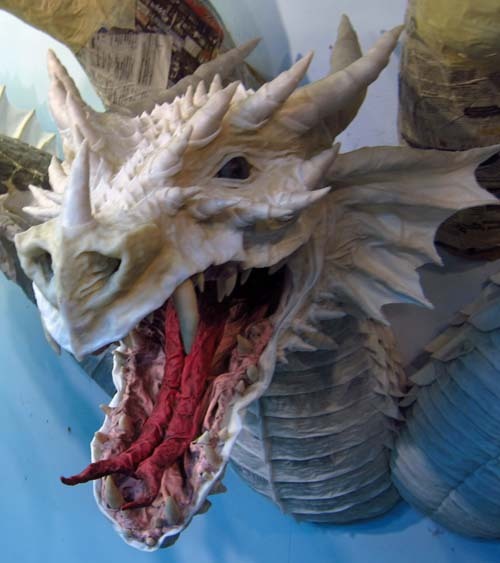 This entry was posted in Tiamat Dragons and tagged arts and crafts, cloth mache, dragons, mixed media, paper crafts, paper mache, paper mache instructions, papier mache, papier mache recipes, sculpture. Bookmark the permalink. I love the wonderful level of detail. Thanks for sharing your progress. Gorgeous as usual!! Just amazing the work you do. Absolutely love it!! Keep up the magnificent work!!! Loving everything on the Red so far. I kept scrolling back to look at his eyes. 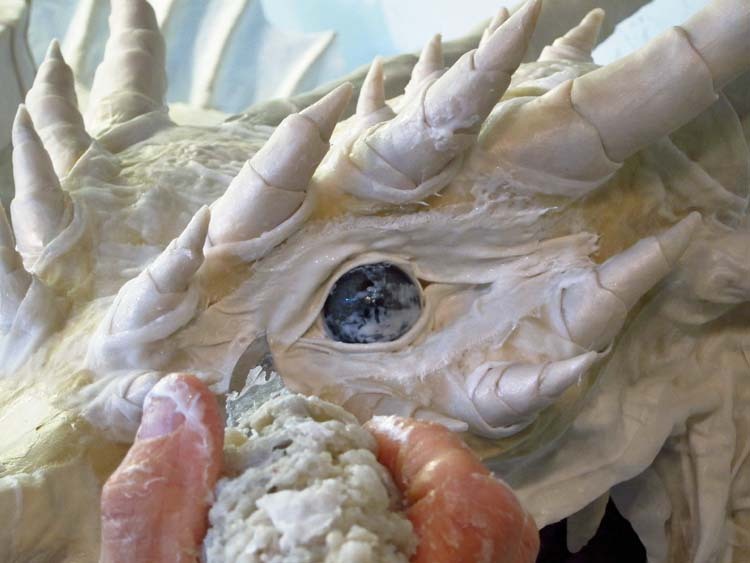 He looks like one nasty dragon but his eyes look knowledgeable. Like he is watching your moves, thinking while he is watching. Simply put… well done! Hi Kat. He IS watching my moves! Glad you like him Diane! Each photo he looks so good then you add something that makes him even better! So much personality there, he’s absolutely stunning. Look forward to the paint job. Thanks Carol. He doesn’t really look like he’s smiling in person. I do appreciate that, and know that I am trying with my grandson, also do a little dragon, we are working together ha ha ha! It is the largest party, but he (my grandson) starts getting impacirente with the delay. Ah!I had never done anything in papier-mâché. Best wishes and much success in your activities. Direct from Rio de Janeiro, Brazil. Eu é que agradeço, e saiba que estou tentando junto com meu neto, fazer também, um dragãozinho, estamos trabalhando juntos rs rs rs ! É a maior festa, mas ele (meu neto) começa a ficar impacirente com a demora. Ah! Nunca havia feito nada em papel maché. Um grande abraço e muito sucesso em tuas atividades. Direto do Rio de Janeiro, Brasil. Wow! Better every time. How can this be? Your posts always make my day. It’s always nice to hear from you Lori! Thank you Trine. Glad you like this! Thanks Amy. Black is next. I’m working on green. Well done Dan it’s coming on and looking great. Thanks Dave. I’m happy with everything so far. 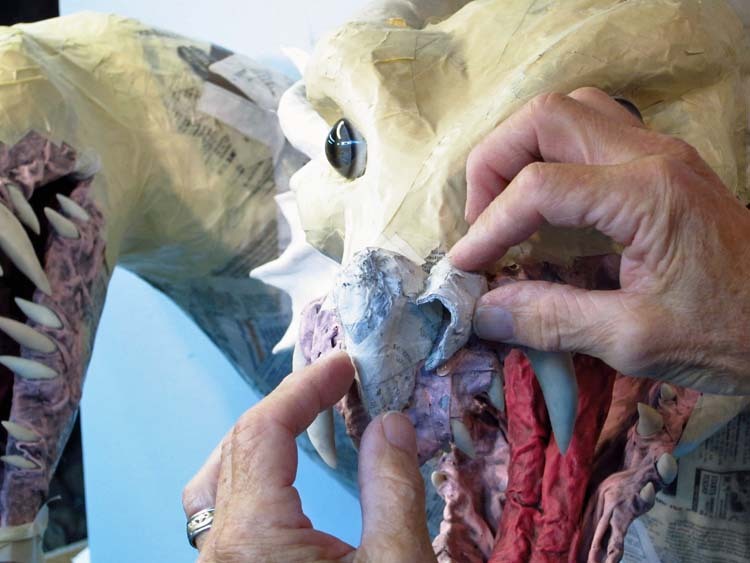 Thank you sooo much for sharing your process, it is wonderful to see the dragons “come to life” under your hands! Love it and “ditto” all the other comments. Glad you are liking this Leslie. Thanks for the note! He looks kind of happy from the front, but angry from all other sides. I’m amazed at the detail and attitude of this piece too, at this stage it is one of my favorite dragons of your’s. Hope you re enjoying the making of the piece! I know what you mean. It’s the way the lips are drawn up in the back. It has a totally different look from other angles. Thanks! I really am enjoying this. Wow! He’s amazing. I really love his facial expression and the way you’ve done the horns. 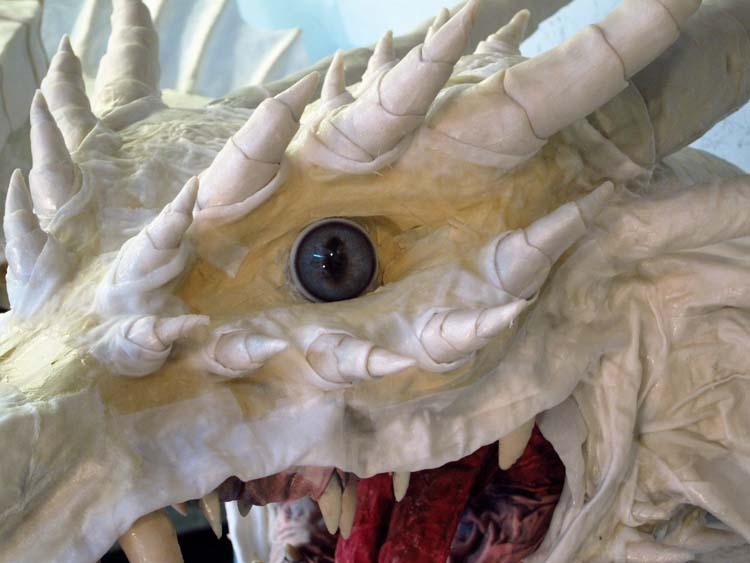 My God man you are truly an artist, love this dragon with the horn on the nose. Thanks Ralph! Glad you like this one! Hi Claudia. Sounds like you are having some fun! That’s great! Yes, there is a lot of great dragon art to look at. I’m glad you like my Tiamat so far. Thanks for stopping by. Are you giving the customer WIP pics or is it going to be a complete surprise? Hi Ralph. No, they are watching the blog posts along with you. They are happy so far. Hola, soy de argentina, yo quiero saber como prepara s la tela mache que tela usas y el prepararado para que se pegue. Estoy haciendo un deagon y mr gusta los detalles que da la tela mache, Gracias . Hola Daniella. No estoy seguro de entender la pregunta. ¿Quieres saber cómo me preparo la tela? Acabo de romperla en tiras y luego lo mojará en el pegamento blanco. Eso es todo. 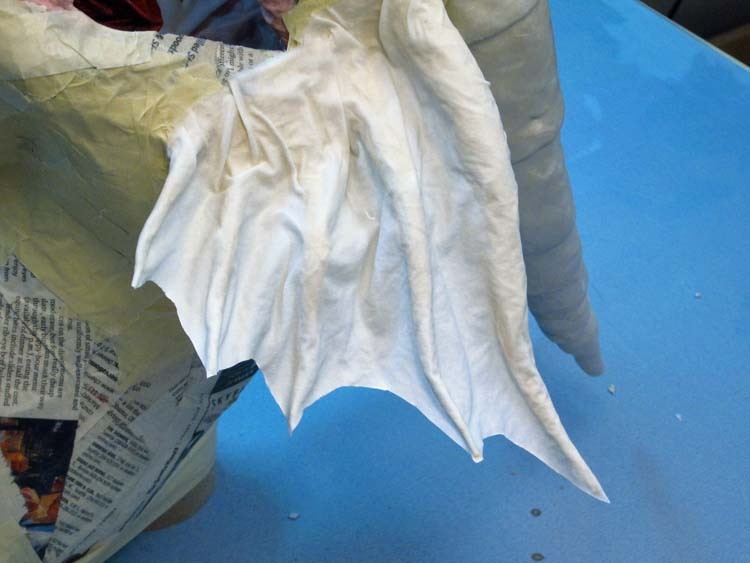 Hi dan, when you wrap the base of a horn in cloth, do you usually fold the cloth before you wrap the horn, or do you just wrap the horn with an unfolded piece of cloth? I’m looking forward to the next project of yours! Hey Grumpmeister. I do both depending upon the look I want. Sometimes I want the horn clearly defined as separate from the dragon. Rolling the cloth helps with that, like having a tooth with gums. 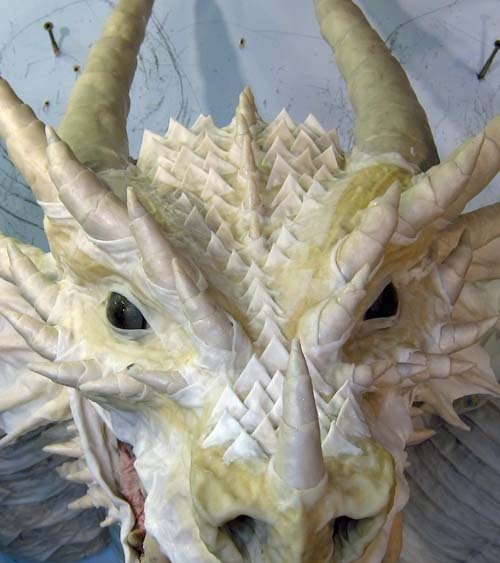 Right now I’m making Smaug, and for that I wanted the horns to look like an outgrowth of the face. In that case I don’t roll the cloth so that it blends into the horn. Thanks, that really helps! 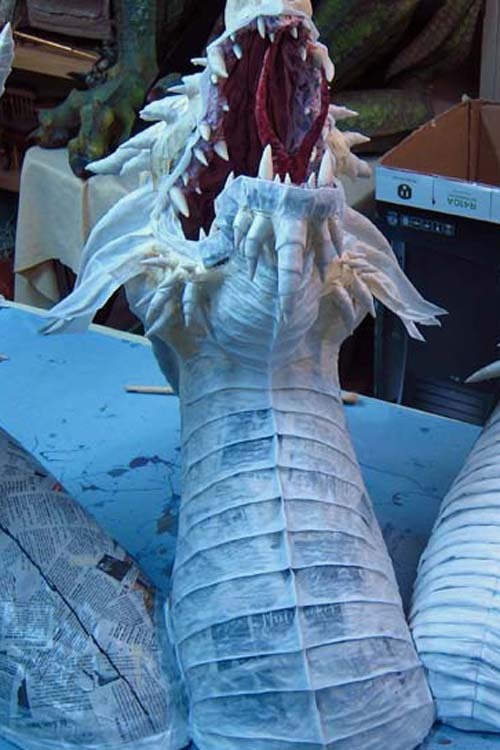 I’m sure that Smaug is going to turn out great, and hopefully he is more fun to build than the dragonfly. Keep up the great effort and continue making amazing art!